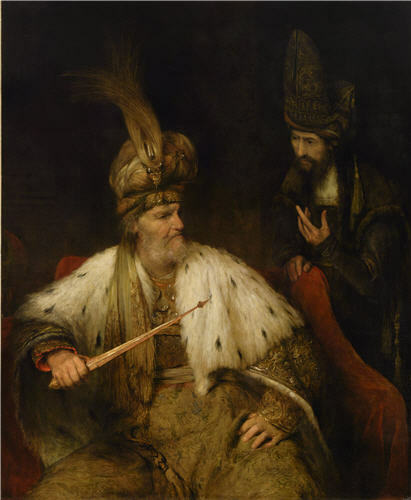 King Ahasuerus (as known as Xerxes) listens to the evil promptings of his first minister Haman. According to the biblical story, Haman plotted a massacre of the Jews in the Persian empire. Here, he seeks to poison the king’s mind against them. De Gelder painted many scenes from the story which culminates with Esther, the king’s Jewish wife, revealing the plot against her people. The artist was Rembrandt’s last pupil, studying in his studio from 1661-3. He adopted his master’s rich brushwork and a love of ornate oriental costumes suitable for biblical subjects.